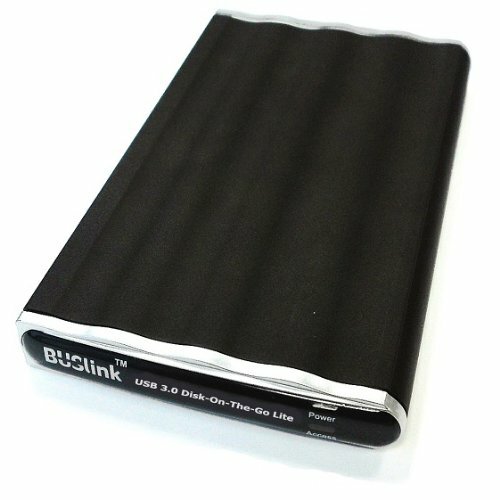 Utilizing SSD inside, BUSlink USB 3.0/eSATA Disk-On-The-Go External Slim Solid State Drive (SSD) series is designed to provide rugged and shock-resistance storage. Since Solid State Drive does not have any moving mechanical parts - like the magnetic platters and drive heads used in traditional hard drives - it resulted in increased durability, faster data access, and minimal power usage. The drive is designed for PC with preformatted NTFS file system for instant compatibility. It can also be reformatted for use in Mac and Linux and features a sleek compact design with metal alloy aluminum enclosure that dissipates heat. Whether you are going to use it for home, business, or school; you can be sure that BUSlink drive is the perfect choice for your digital data storage needs with its portability. System Requirement: Microsoft Windows 10, 8, 7, Vista, XP, Server 2012, 2008, 2003, 2000, Mac OS X 10.4, Linux. Package Content: USB 3.0/eSATA Disk-On-The-Go External Slim Solid State Drive (SSD) Drive, USB 3.0 micro-B cable, and User manual. View More In External Solid State Drives. If you have any questions about this product by Buslink, contact us by completing and submitting the form below. If you are looking for a specif part number, please include it with your message. OWC 1.0TB Envoy Pro EX USB 3.0 Portable SSD Solution.